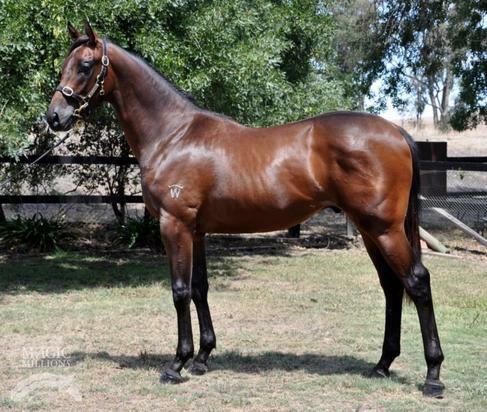 This colt is by young Swettenham sire Trust in a Gust who won from 1000m to 1600m with his dam winning over 1850m. Super Vobis nominated and he'sstraight to the spelling farm after the sales. He's a lovely walker and Ryan was delighted to secure him for such a good price. Costs to consider when purchasing include spelling , floating, gelding , MM series and breaking in. TRUST IN A GUST (AUS) (Chestnut 2010-Stud 2016). 10 wins from 1000m to 1600m, A$1,170,150, MRC Toorak H., Gr.1, Sir Rupert Clarke S., Gr.1, 2d MVRC Chandler Macleod S., L, 4th MRC Gothic S., L. Out of a three-quarter-sister to SW Balanchine (Irish Derby, Gr.1), a half-sister to SW Red Slippers and SW Romanov. Closely related to SW Thunder Snow (Saint-Cloud Criterium International, Gr.1), SW West Wind, etc. His oldest progeny are yearlings. BIKINI DANCER, by Bernardini. Winner at 1850m in Aust. This is her second foal. Her first foal is a 2YO. Bikini Dancer. Winner. See above. POST THYME (Postponed). 5 wins. See above. Jay Jay d'Ar. Winner at 2 in 2017-18, MVRC Friday Night Lights 2YO P., 3d VRC Summer at Flemington H., MRC Big Screen Company H.
Imminent. 6 wins from 1400m to 1600m in Aust. Hot Taste. 5 wins from 1200m to 1600m, A$137,405, VATC Smorgon Arc P., MVRC Crown World of Entertain H., VATC Ken Sturt H., 2d MVRC Ringwood H., VRC Clipsal H., VATC HM (Monty) Trevethan H., MVRC Koala Toys H., 3d VRC Fashion at Flemington H., VATC Swinburne University Chancellors P., Bert Bryant Welter H., Jayco Caravan H., Saxony Welter H., MVRC Schweppes H., Gold FM H.
Cinna Miss. Winner at 1350m in NZ. Hillbilly Bear. 2 wins at 1100m, 1200m, Singapore TC Class 4 H., Initiation P., 2d Singapore TC Initiation P., Class 4 H.
Dapper's Express (Sir Dapper). 9 wins-1 at 2-from 1000m to 1600m, A$83,885, QTC XXXX Long Neck H., BATC XXXX Qld Horse H., 2d VATC Japan Racing Association P.H., L, MVRC Tatts Instate Scratch-It H., QTC Painted Red H., VATC Normanby H., Stratford Welter H., 3d VRC Yarraville Welter H., MVRC Ana H, QTC Bennett H., Herston H.